Come solve a mystery in Stockholm! 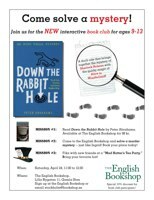 Join us for the NEW interactive book club for ages 9-13. Download and read your misson! "With America quietly gearing up for war in the Middle East, 20-year old Tassie, from the plains of the Midwest, goes to university in the hope of escaping the complex world of culture and politics. As the year unfolds, she is led to new and formative experiences, and the future bursts forth in dramatic and shocking ways." Interested? Talk to (or email) the book sellers to book your seat. Uppsala, Tuesday 24/2 at 7pm. Stockholm, Wednesday 10/3 and 17/3 at 7pm.